Apple Inc plans to begin production of a refreshed iPhone similar in size and shape to its current one in the second quarter of the year, according to people familiar with the device’s production, teeing up a possible summer launch for the next version of its flagship device. At the same time, Apple continues to work with its manufacturing partners in Asia on a less expensive iPhone that could be launched as soon as the second half of this year, these people said. The four-inch device likely will use a different casing from the higher-end iPhone. Apple has been working on different color shells for the phone but its plans remain unclear. The other 376 are absolute garbage and actively make the reader dumber. The two devices reflect new pressures on Apple. The Cupertino, Calif., company has long commanded unique premiums for the iPhone, but consumer demand for cheaper products is spiking. But is a conjunction is commonly used to list two contrasting facts about the same topic. A flood of smartphone entrants and the rise of Samsung Electronics Co. have commoditized the market, squeezing margins and dividing profits among an array of devices. “There isn’t really any major differentiator between the players at this phase,” said Neil Mawston, an analyst at research firm Strategy Analytics. He said to cope, Apple needs to take a page from Samsung and launch more products faster. Mawston, like most analysts, seems unaware that phones can be differentiated by more than speeds and feeds, and is thus fixated on the lower right corner. Here there is no differentiation, everything is commoditized, and the day is won with volume, supply chain dominance, and wide distribution. And Samsung is winning in all three areas. They have the greatest volume, the own what is likely the most efficient supply chain, and they are available on basically every single carrier in world. (The vast majority of that volume is actually at low price points. The Galaxy S is only about 10% of their total volume of smartphone – the article wrongly suggests it is 100%.) Kudos to them! But it turns out there are two sustainable positions in an industry (and to be clear, this isn’t exactly rocket science. Again, business school…). 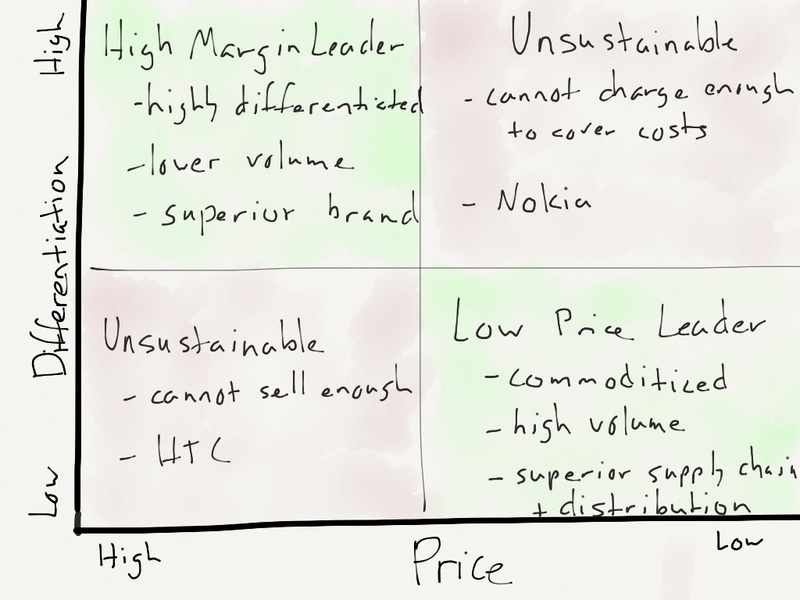 The low cost leader – Samsung – and the highly differentiated one. See, Apple already did “transform the industry with a revolutionary design.” And while Android has made significant gains on the hardware, software, and even ecosystem fronts, the overall package offered by Apple is still highly differentiated. The evidence bears this out: Apple charges the highest prices for phones, happily subsidized by carriers (especially in the US), because customers will change carriers to get the iPhone. This results in by far the highest margins in the industry with only a small portion of the overall volume. Samsung’s share of global handset shipments rose to 25% in 2012 up from 21% in 2011, according to Strategy Analytics. Apple’s rose to 8.6% from 6.0%. Last year, Apple captured nearly two-thirds of the profits in the industry, up from 62% in 2011. Samsung’s share rose to about a third from 19%. The total disconnect between this final paragraph and the rest of the article is mind-boggling, and truly does a disservice to the reader. Not just because it’s wrong – although it is – but because it overlooks the much more interesting truth that Apple is facing challenges with the iPhone. While their current position is very secure – and suggesting it isn’t is where this article, like many others, goes wrong – they are moving ever closer to saturation in the markets where carrier subsidies shield customers from the iPhone’s true cost. In fact, Apple’s stock slide is understandable; theoretically, the stock price accounts for future growth, and the flipside of saturation is continued high profits but lower (or even negative) growth. Apple dominates every market, like the US, where price is immaterial. They are not under much threat from Samsung or from anyone.3 A lower-cost iPhone, which is still differentiated but approachable on a full-cost basis, is about growth in unsubsidized markets (like India for example), and is the key to avoiding saturation (and unlocking the stock price). While the company is widely believed to have innovative products up its sleeve, many analysts think the next developments that could really disrupt the market—like bendable displays or mainstream wearable devices—are years away.